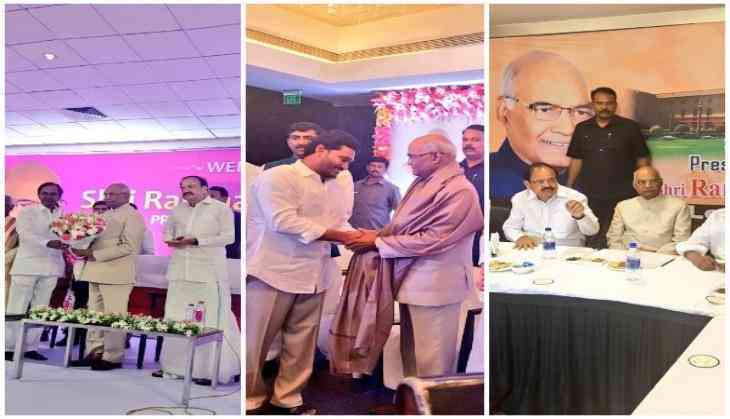 The National Democratic Alliance (NDA) Presidential candidate Ram Nath Kovind on July got support of the Telangana Rashtra Samiti (TRS), Telugu Desam Party (TDP), and YSR Congress Party (Yuvajana Shramika Rythu Congress Party). The support came after Kovind met with the leaders of these parties in Hyderabad. Union Information Technology Minister M Venkaiah Naidu was accompanying Kovind, as he garnered support. Naidu made this announcement in a series of tweets. "Happy that TRS party has expressed its support to the NDA Presidential Nominee Sh Ram Nath Kovind (sic)," Naidu tweeted. Announcing support of the TDP to Kovind, Naidu tweeted: "Happy that TDP party has expressed support to the NDA Presidential Nominee Sh Ram Nath Kovind." In his earlier tweet, he said that "Happy that YSRCP party has extended support to the NDA Presidential Nominee". The election for the next President of India is to be held on 17 July as President Pranab Mukherjee will demit the office on 24 July.